After posting a 500 word comment on Facebook to a friend regarding my stance on electric mountain bikes, I realised I needed to put my thoughts down on paper and discern why I’m fervently against them. I want to be clear that the specific types of electric mountain bikes I’m speaking of are production models made by already established bicycle companies; the realm of aftermarket kits is going to have to wait. A popular mountain bike website recently ran a story by someone strongly in favour of e-mountain bikes and many of the comments that followed rang true with how I feel about them as well. The pro argument goes like this: ‘further and faster’, the author of said story claiming they were able to log 160km within three days because of electric technology and that E-bikes are simply the next big change in the mountain bike industry. The term ‘paradigm shift’ was used a lot and they likened E-bikes taking flack to the same way a new wheel size, component, extra gear, extra inch of travel, carbon, buzzword, etc incite debate. Also, many bicycle companies are delicately dodging the moniker of ‘motorbike’ by labelling them ‘extreme performance mountain bikes’. Okay, fair points. Now prepare to be destroyed. Claiming that strapping a motor to a bicycle allows you to ride more is ridiculous. You can ride as often and as far as you want. What if that fancy technology happens to need a charge when you’re ready to go for a spin? Are you really going to jump on a bike with an extra 14kg of dead weight? I doubt you’ll be going very far or very fast at all. Not to mention if the batteries die in the middle of some epic backcountry journey. Yes, I’ll admit I had a few things to say when the bicycle industry adopted a new wheel size essentially overnight (which, having been used for decades on touring bikes, isn’t really new at all). The wheel size debate seems to pale in comparison with this whole E-bike issue at hand though. I look forward to riding with my friends regardless of what size wheel they choose. It doesn’t matter to me or them, because all of us are pedalling just the same. (Those of us still on 26” are probably having more fun, but that’s another story.) This egalitarian view will be blown out the door if a mate ever rocks up to a group ride on an E-bike and doesn’t even crack a sweat on the climbs. It takes the fun out of watching out of shape friends suffer and removes the challenge of trying to keep up with the ones that ride more than you. In a nutshell, it’s cheating. Moving right along. A bicycle is a vehicle; it must obey the rules of the road, as do cars and motorcycles. 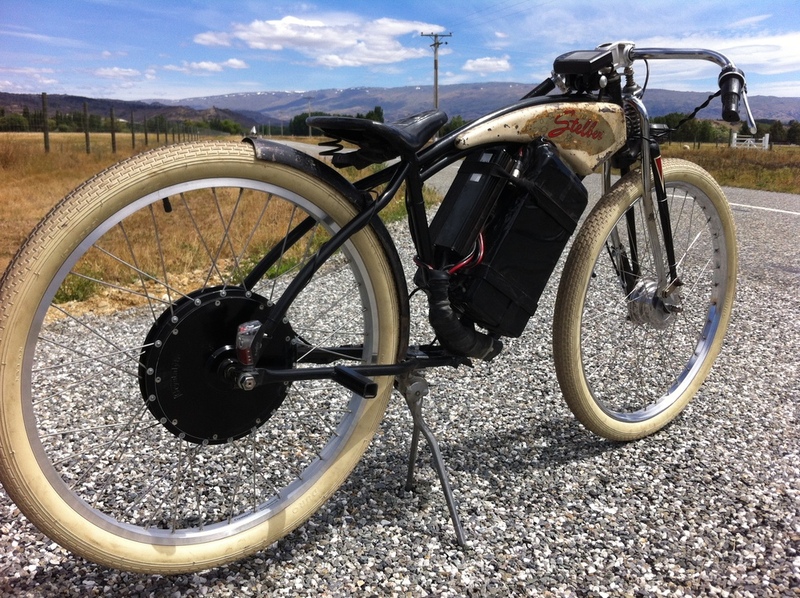 The thing that powers an E-bike is a motor (an engine is powered by combustion, where a motor is powered by electricity). Therefore an E-bike is a motorised vehicle. It doesn’t matter how it’s defined legally, just call it what it is. Since the beginning, mountain bikers have been faced with the challenges of trail access. It’s a constant battle, more so in some parts of the world than others. I believe E-bikes could be the tipping point that throws off the delicate balance mountain bikers share with other trail users. E-bikes are motorised vehicles and if you want to ride a motorised vehicle, go somewhere that’s used by other motorised vehicles. Riding a local multiuse trail on an E-bike is poaching, simple as that. This debate is in its infancy and is no doubt going to rage for years to come. More and more bicycle companies will be following trends in an industry they’ve created in an effort to sell us more stuff we really don’t need. If you’re a commuter and looking for a new bike, or considering cycling to work more, I urge you to take an E-bike for a spin. They really are in their element in an urban environment and are wonderful tools for the job, but please stay off trails. My comment to mountain bike companies regarding E-mountain-extreme-performance-mountain-bikes is the same one I’d make to someone who wants to put cheese in a spray can: just because you can, doesn’t mean you should.